Exceptionally large and rare United States flag flown aboard Apollo 12, and included on the lunar module Intrepid when it landed on the Moon in November 1969. 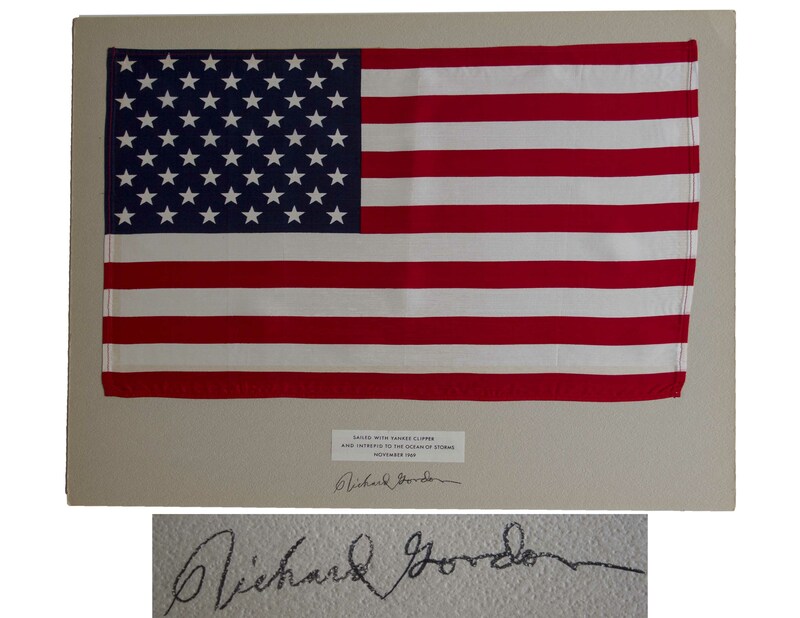 Flag measures 18'' x 11.5'', one of the largest Apollo flown flags, affixed to presentation mat measuring 20'' x 16''. Mat is signed by Apollo 12 Command Module Pilot Richard Gordon, above a note stating, ''Sailed With Yankee Clipper / And Intrepid to the Ocean of Storms / November 1969''. Mild show-through of glue on flag; overall, entire presentation is near fine. From the estate of Richard Gordon.